Nearly 36,000 Americans will be diagnosed with oral cancer and another 7,600 will die from the disease this year alone.1 Oral cancer is one of the most deadly and disfiguring forms of cancer, yet it is also one of the most preventable. As with the fight against any cancer, increased awareness and early detection of oral cancer is instrumental to combating this deadly disease. Of those who see a dentist on a regular basis, studies have shown only 15 percent report that they've received an oral cancer screening. An oral cancer exam is a quick and painless procedure that can help catch cancer early. It involves an evaluation of the neck, head, mouth, gums, throat and tongue. During the process, your dentist will use a piece of gauze to pull the tongue forward and move it from side-to-side in order to check the harder-to-see areas in the mouth. At your next dentist appointment, pay attention to what your dentist is doing. Here's what an oral cancer exam should look like:Lumps are a common sign associated with cancer, so with both hands, a dentist will feel under the jaw and sides of the neck for enlarged lymph nodes. He or she will also feel the floor of your mouth by placing a finger under your tongue and the fingers of the other hand under your chin. By applying pressure, enlarged nodes or other hard spots can be detected. Asymmetry of the face and mouth also warns a dentist of a health issue. They will look for irregularities in the face and the back of the throat and the tonsils, such as drooping or a subtle swelling on one side. 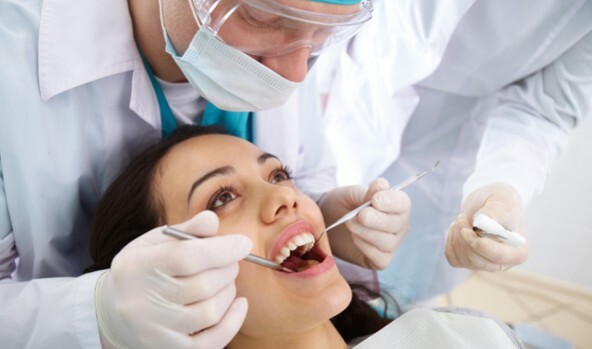 The dentist will also give a thorough inspection for cancerous or pre-cancerous tissues, seen as red or white patches or thickened areas, on the inside of your lips and cheeks. The tongue is a common site for oral cancer so patients will be asked to stick out their tongue so the dentist can see if it deviates to one side or the other - a sign that something is affecting the nerves that control movement. Then, using a small gauze, the dentist will pull out the tongue to check for lesions at its base (the area that it beings to curve down into your throat), on each side, and underneath the tongue. Dentists may see red or white spots in the mouths of about 10 percent of patients. Although most of these spots are harmless, some are not. If a dentist determines the tissue needs to be tested, adjunctive diagnostic tests like the Oral CDx Brush Test may be performed. These tests may be covered by insurance plans, like Renaissance Dental. The test is a quick and relatively painless way to sample and analyze potentially precancerous and cancerous cells. The dentist uses a small brush to gather cells from the lip, tongue or oral mucosa (the mouth's mucus membrane) and sends the sample to a laboratory for computer-assisted analysis. Results are faxed back to the dentist within three days. Regular visits to the dentist are the best way to detect cancerous and pre-cancerous cells in early stages. If your dentist is not performing oral cancer exams during your visit, do not be afraid to ask for one. Being informed is the first step to protecting your health. Oral Cancer Foundation, http://oralcancerfoundation.org, accessed May 2012. Robert P. Mulligan has an extensive background in building and growing dental plans. Mulligan has held executive positions at several leading insurance companies. Dr. Jed Jacobson is an expert in dental research, especially in the ways oral health affects overall health. Previously, Jacobson operated two Michigan dental practices and served The University of Michigan's School of Dentistry in various academic appointments. ‍Robert P. Mulligan, president and CEO of Renaissance Life and Health Insurance Company of America, has an extensive background in building and growing dental plans. Mulligan has held executive positions at several leading insurance companies. He graduated from the State University of New York. Dr. Jed J. Jacobson chief science officer of Renaissance Life & Health Insurance Company of America, is an expert in dental research, especially in the ways oral health affects overall health. Previously, Jacobson operated two Michigan dental practices and served The University of Michigan's School of Dentistry in various academic appointments.